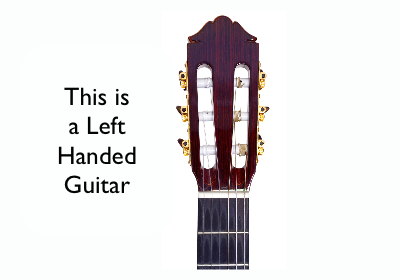 Ok so what do we mean by right and left-handed guitars? 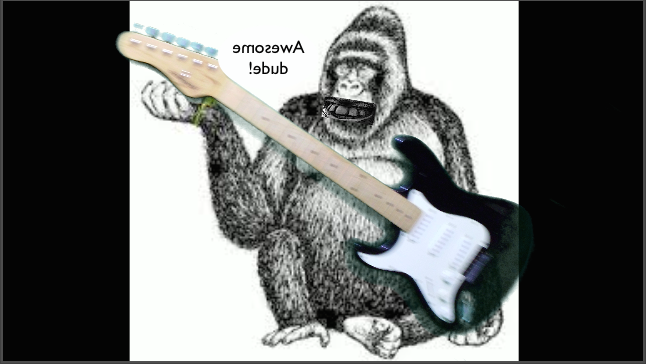 By historical convention the guitar as we know it today is laid out so that when held in its playing position of majority the right hand is the one doing the attacking, i.e. strumming, plucking or picking. 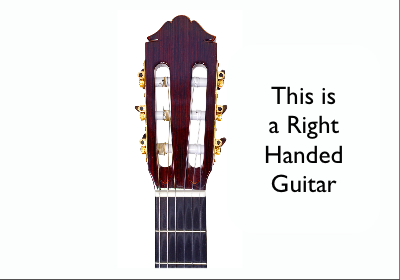 This leaves the left hand in a position to do the fretting. That means to “stop” the strings over the frets to shorten them. This is really just putting your finger on a string right next to the fret you want (with your finger on the headstock side and the fret on the sound hole side). Pitch: which way is up? which way is down?...which string is which? 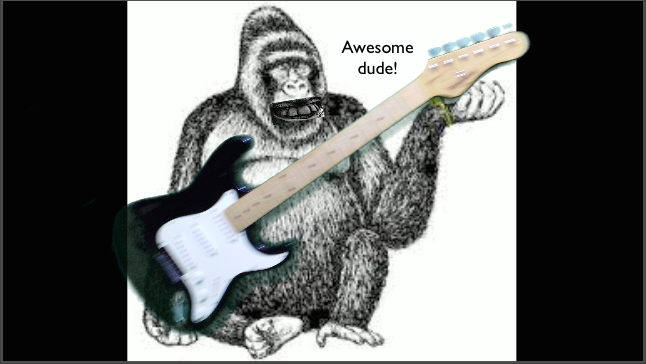 Click on the following link if you are unfamiliar with some the above terms, that are referring to parts of the guitar. For more on this you can also go to the top of the page entitled types of guitar. - IF the (thicker/bigger/wider) bass strings are on your left and the (thinner/smaller/narrower) treble strings are on your right, then you are looking at a Right-handed Guitar. - IF the (thicker/bigger/wider) bass strings are on your right and the (thinner/smaller/narrower) treble strings are on your left, then you are looking at a Left-handed Guitar. Get My Free App it will help to support this site! The right handed convention is the standard majority but it is NOT exclusive. Roughly 12% of men and 10% of women are likely to be left handed in the whole world. If you are left handed and wish to ignore right handed material in publication in favour of the left handed point of view you have much more choice these days since the advent of the internet. Staff notation is again a winner here as it is universal for all instruments and free form the perspectives of handedness. If you decided to learn both systems you may find yourself eventually not bothering with the minority left handed versions of things unless there is a special niche of unique left handed version music that interests you. Many of my left handed students play righty and visa versa. You have to decide what’s right for you yourself. Left handed people also do play right handed strung guitars placing them 180º around into a left handed orientation (number 2. above). This is what I meant about never seeing a diagram of that orientation at 3min: 40sec into the fretboard orientation video. Although that diagram represents a left-handed point of view, it is not a true left-handed chord diagram. (a true left hand chord diagram is a mirror image of the right hand diagram) As shown here below. If you are set on playing and studying from a lefty point of view there are many resource sites such as leftyfretz.com that you could try. What ever you decide it must be your decision to live with. Music in itself is not handed. If you play any instrument in a left handed posture do not cut yourself off from any aspect of the joy or language of music because of any one else’s projections, hang-ups or frustrations about dominant hands. In other words for example, play left-handed by all means but don’t cut yourself off from all things right-handed as resources. It all depends on your goals and motivations and many other things. I have no idea if left handed players of right handed guitars, pianos, violins, or Dr Seussophonium snooter-flutes are at any disadvantage or advantage. A right-handed sales person may well want you to go down a right-handed path. A left-handed person who tells you that ALL right-handed people are full of crap may well have their own hidden agenda (or in the least perhaps be affected by some kind of “defiance opposition disorder”). I would be wary if you get the “I will tell you what’s right for you” attitude form anybody! Don't be bullied by "hand-ists" lefty or righty! I hope this helps you a bit if you are just starting out and trying to make a decision. At the end of the day it comes down to what you feel most comfortable with both physically and psychologically. Looking for Lefty Guitar Bargains?